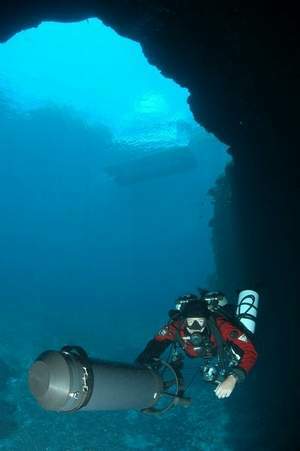 Projectdives at Wakulla Springs in 2006. The Department of Environmental Protection has not made a decision on whether to allow recreational cave diving at Wakulla Spring, but Florida Park Service officials plan to consider the idea further. Park Service Assistant Director Scott Robinson said this afternoon that his staff will create a draft plan for allowing limited recreational cave diving at the first-magnitute spring and present it to the public for further input before deciding to change the park's long-standing policy forbidding the practice. "This is not a final decision," Robinson said, "we are simply continuing to look into it." Public comments at a workshop held last month on the idea were evenly divided between those for and against the policy change. Robinson said there is no strict timeline on fashioning the draft plan, but that staff members will be working on it diligently. "We won't let this become stagnant," he said. "We are moving forward."